Deciding to go on a “spring break’ trip 48 hours before departure is the epitome of you. My life is typically very planned. I thrive with consistency and discipline. But everyone needs you in their life. Everyone. I don’t care how disciplined you are, we all need to have some unplanned fun. Everyone. That’s why 48 hours before departure, my friends and I decided to go to Chicago! Somehow we always seem to land on our feet, find great deals and have a blast in the process. Our Chigaco adventure was no different. Roadtrip to Quincy, IL…Home of THE Brooke Ledawn! Road my first train from there to Chicago! Fun couple of days with Brooke and Laine! Happy St. Party’s Day from the “green” Chicago River! My favorite picture from the trip…thanks Asian tourists for capturing this! Oh hey Chitown!!! Kicking on the 95th floor of the John Hancock Tower! The Gardens at the Navy Pier…finally a picture without coats! And I had real Chicago pizza today!! Navy Pier, Chicago skyline and friends that don’t miss a beat! Where’s the most spontaneous place you’ve traveled?! I love to have fun. I can also be pretty competitive. Combine the two, and I’m all in. I hit the road recruiting for Kanakuk next week and that in and of itself is fun and exciting. Throw some of you into the mix on top of all the adventures I already know are going to happen”…I’m excited. And I want to win. So here’s the scoop. Best photo taken during our travels in the following 5 categories wins. It’s that simple. I am already known for making memories and having a whole stinkin’ lot of fun on the road. “Breaking into’ stadiums. Getting locked into them and literally scaling a wall to get out. Visiting creepy Elvis shrines. Finding secret rooms. First time motorcycle ride. I love to travel. I love to have fun. I was already doing this kind of thing anyway, but this just added a whole new dynamic to my travels. This is where you come in. I can’t do this on my own. I don’t quite know where adventure lies in cities I’m unfamiliar with. Plus adventures are ALWAYS way more fun with friends. Here’s the list of where I’m coming this fall. I’m already excited to simply see you and do life together in the flesh, but I also need you to brainstorm how we’re going to win this contest and make memories in the process. If I’m not coming to see you, feel free to suggest ideas or even road trip to find me 🙂 Kidding. Kind of. I don’t think I ever realized how much I love and look forward to you in my life. Seriously, I love making memories, visiting iconic sites, eating at local venues and doing the most unexpected things. I’m not sure I would have understood this about myself if I hadn’t done this job that involves a crazy traveling schedule. I get to see SO many fun people in these places, and I just know you will show up several times along the way. I can’t wait to see what you have in store for me. Maybe the best part about all this……once I finish these three weeks of traveling, it’s Thanksgiving!!!! Which means it’s my favorite holiday and family, friends, food and Oklahoma happen the next week after my travels. As much as you’ll show up while traveling, I know you’ll poke your head in the midst of the Rothers as well! Posted on November 2, 2011 November 2, 2011 Author lindsayrotherCategories UncategorizedTags adventure, travelingLeave a comment on Letter #390: Next Adventure? Letter #114: Who Knew I Was Gothic?! By my 9th week of travel, I have become known as quite the “gamer.’ I’m always up for an experience. New cities, new states and new campuses instantly equate to fun memories in my mind. The experience is always what I’m looking for, so chain restaurants and sitting in hotel rooms are bottom on my list of activities to do in a new place. Part of this is because I’m 23 and simply look for you at all times as well as this being my first time to travel the country. I think the biggest reason is I just like to have fun! I’ve had some great moments in the past few months, but this week all stops were pulled. Touring Memorial Stadium and Husker football: epic. Visiting an old kamp guy at the art shop where Golden Globe trophies are made: random. 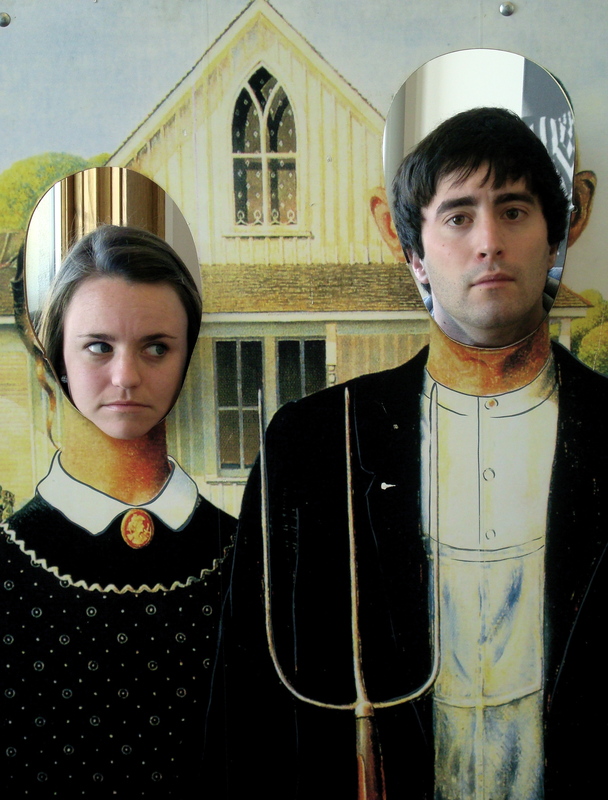 Stumbling upon the American Gothic Museum in Eldon, Iowa: priceless. You see, I offered to drive from Des Moines to Quincy, IL. 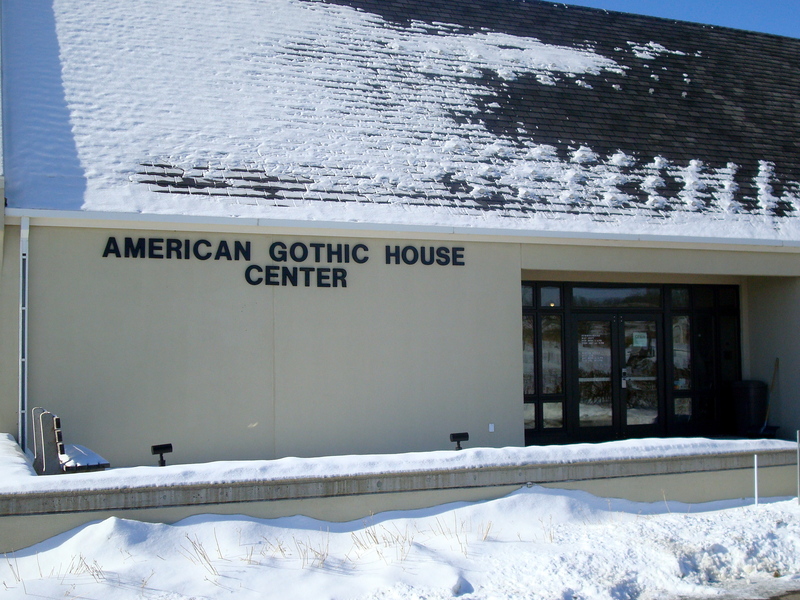 There’s no good way to get there, so after nearly being run off the road into an abyss of ice and snow by an idiot who was texting while driving, we came across a sign declaring “American Gothic Museum’ 50 miles. 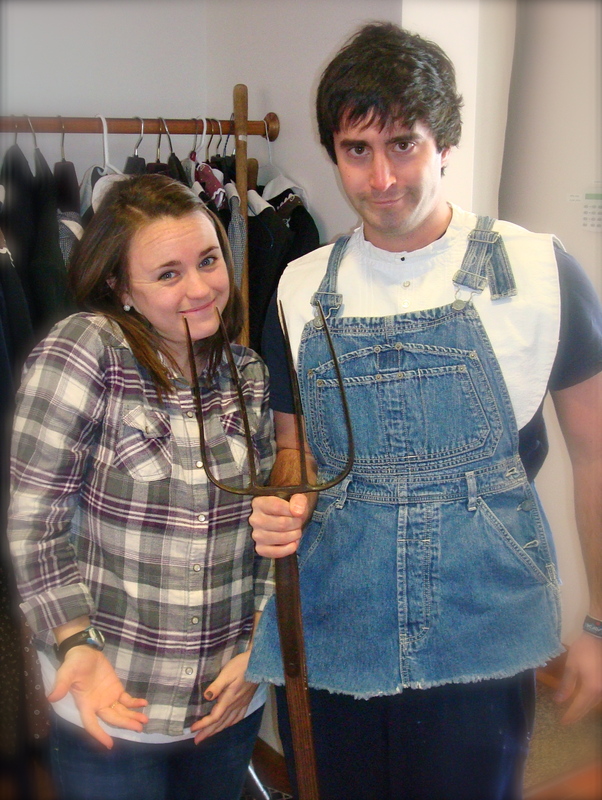 Jokingly, I asked Kara (K-Kountry intern and dear Branson friend) if she wanted to stop. We laughed and didn’t think twice about it. Then, we entered Eldon and saw the same sign pointing us to one mile away. We happened to be way ahead of schedule, and Kara could tell I was up for you. Without Allen’s (the other K-Kountry intern; yes, they sent us on trail together!) knowledge as he was napping in the back of the 15 passenger, we turn in. Driving up to this, I still have no idea what we are getting ourselves into. Kara and I walk in, and this is hanging front and center. Still no idea what I’m entering. My initial connotation was a bunch of teens dressed in black. Kara anticipated the gothic art era. She was WAY closer than me. 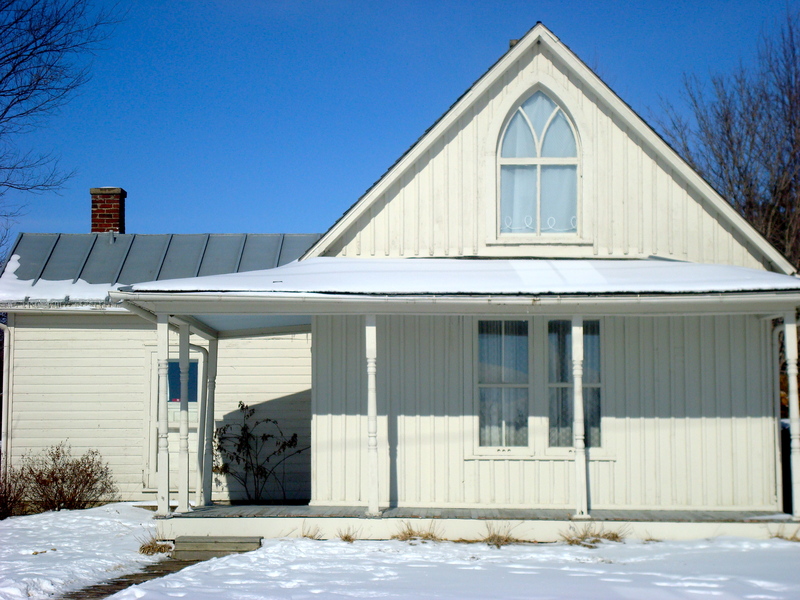 The museum employee comes around the corner and finally informs us we have stumbled upon THE house that inspired the painting, American Gothic. Into art or not, everyone’s seen this piece. 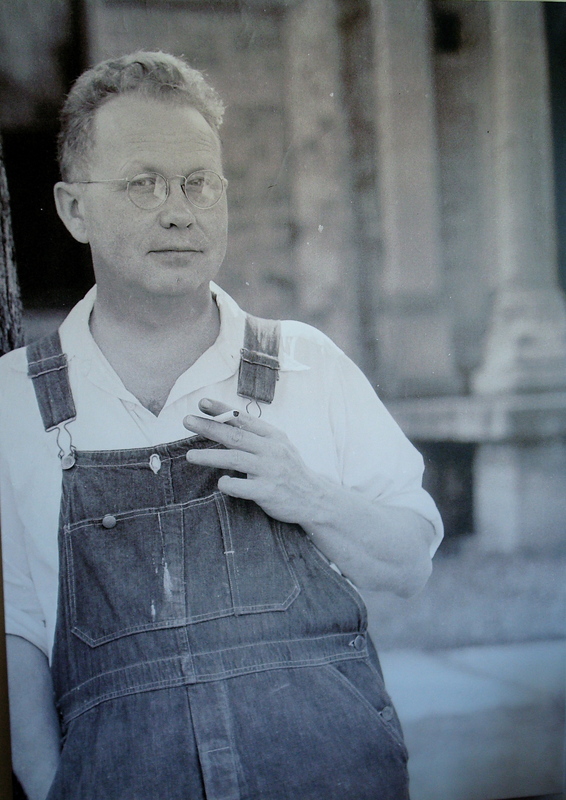 Grant Wood happened to pass through Eldon, saw and painted the house, then returned to his studio in Cedar Rapids. There, he had his sister and dentist pose. 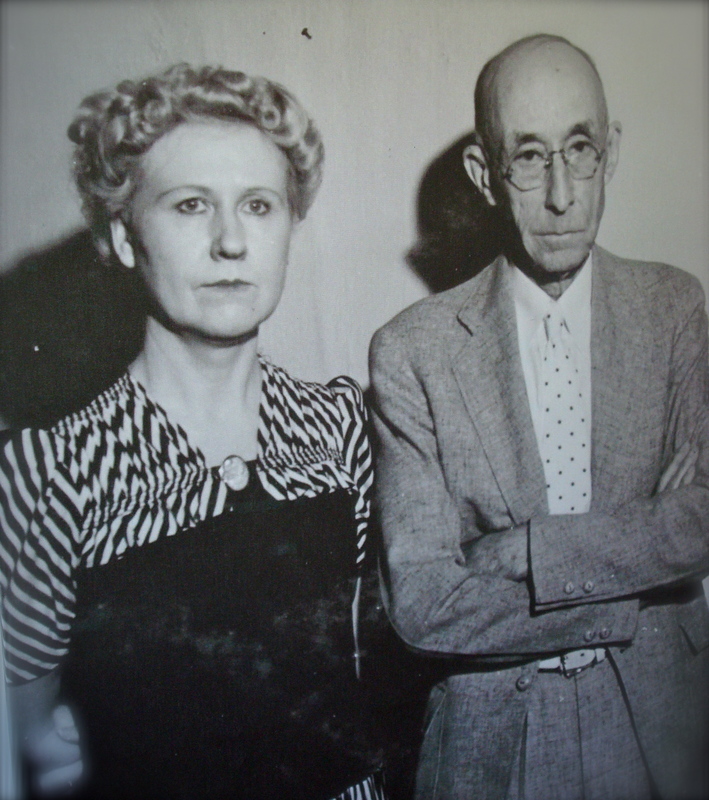 They never stood in front of the house nor posed together. 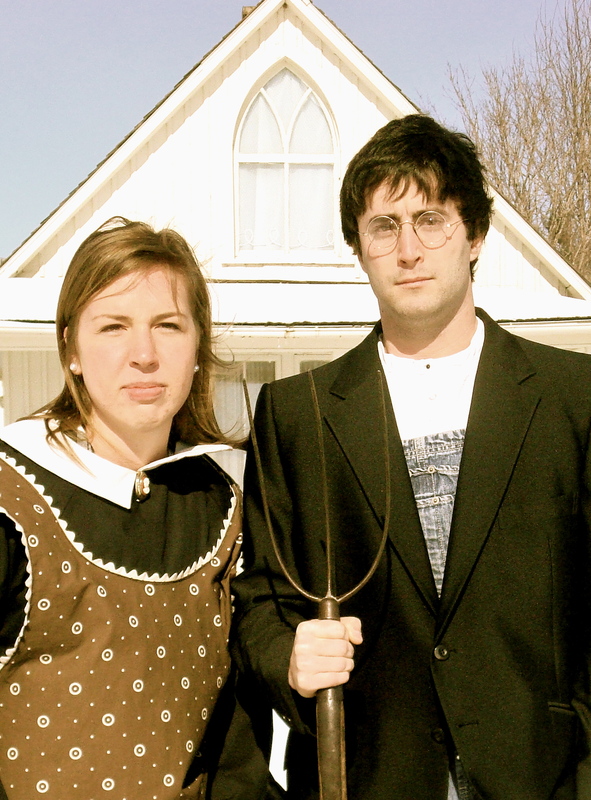 This painting is probably the most parodied and familiar painting from the 20th century, and we got to dress up and pose in front of the actual house! Of all things to stumble across, this was awesome. I feel more cultured and educated, and it’s just another ridiculous story to add to the books. Thursday, I was reminded to make time for random stops, conversations, meals, experiences and you. Thanks for the reminder. 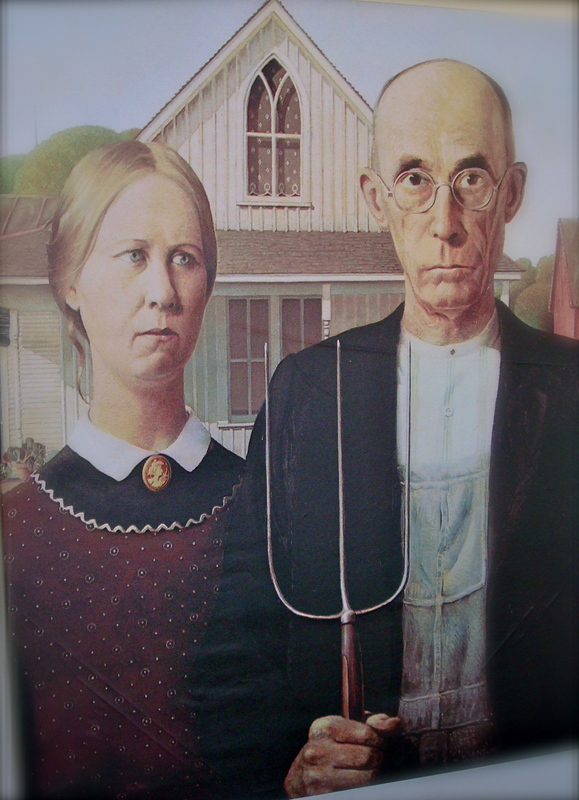 Posted on January 22, 2011 July 7, 2011 Author lindsayrotherCategories UncategorizedTags adventure, American Gothic, American Gothic Museum, Eldon, Iowa, museum, painting1 Comment on Letter #114: Who Knew I Was Gothic? !